Olga de Amaral was from the beginning of her career a highly regarded textile artist. Over time, she replaced her traditional loom-based practice with fiber-based plating systems of her own invention. These plating systems allowed Amaral to make larger works and incorporate diverse media in her work, including: gesso, paint and precious metals. Amaral’s evolving technique transformed two-dimensional textiles into three-dimensional sculptural objects. These “off-stretcher works”, as they have come to be called, are increasingly acknowledged for their unique aesthetic power and influence on the development of Post-War Abstraction. For the past thirty years, much of Amaral’s art has incorporated gold. Her use of gold was inspired by a visit to Japan. In Kyoto, she observed “kintsugi,” the repairing of broken ceramics with gold-leaf. 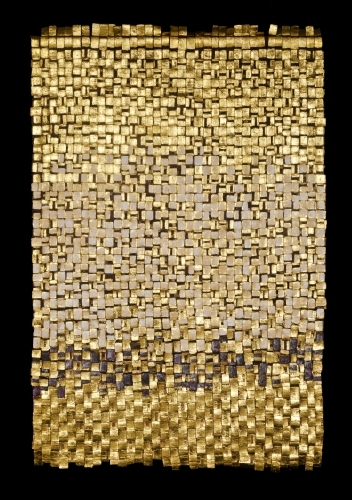 Subsequently, Amaral investigated gold’s expressive possibilities of light and texture. She also contemplated the varied meanings of gold, which differed radically between Pre-Hispanic and European cultures. For Europeans, gold represented material wealth. For Pre-Hispanic cultures, gold embodied the otherworldly. This dialectic, of materiality and the otherworldly, pervades Amaral’s work. As gold is wed to Amaral’s formal and conceptual needs, so is color. Throughout Colombia, Peru, and other regions of Latin America, Pre-Hispanic shamans and explorers journeyed great distances in search of sacred objects. Feathers, in particular, those of brilliantly plumed birds, were collected and incorporated into ceremonial vestments and mantles. Amaral’s palette takes inspiration from these objects of adornment. “There are no equivalents for Amaral’s art in archeology”, so says art historian Edward Lucie-Smith. Although Amaral’s art may evoke the ancestral, she is a modern artist working in non-traditional formats of her own invention. Her art is aligned with an array of Modernists. Her use of gold has affinities with works by Yves Klein, Lucio Fontana, and Mathias Goeritz. Her investigations of light and color, like those of Jesus Soto and Cruz-Diez, make a unique contribution to the development of Kinetic Art. Also important is Amaral’s transformation of “craft-based,” utilitarian material to fine art, an achievement that aligns her with Peter Volkous, and Ruth Asawa, among others. Whether celebrated for her unique synthesis of varied media, or her ability to combine a luxurious materiality with the otherworldly, Olga de Amaral remains a singular artistic presence. Rooted in the Americas and yet universal in scope, Amaral’s art rejects limited notions of categorization and hierarchy in favor of a unified vision of the world.